A Von Mises stress analysis in the simplest terms is a method to simulate a load on a structure and return visual “hot spots” (structural stress). In the design world, this is basically a commodity tool from an ever increasing number of vendors. All of the FEA/FEM vendors that typically integrate with CAD systems or utilize CAD files for design fidelity, perform meshing of the CAD object for analysis. So what about the manufactured object? In the design phase, usually involving several iterations between design modification and FEA testing, the final design is achieved with the designed structural strength and safety factor. Typically, the manufacturing process is theoretically presumed when the design model is created during this process. Downstream, the object is manufactured and may be either digitally scanned for traditional FEA, or subjected to physical (often destructive) testing. In the case of digital scanning, which includes both optical and X-ray (3D CT), typical output is a mesh that can be returned to a traditional FEA application. 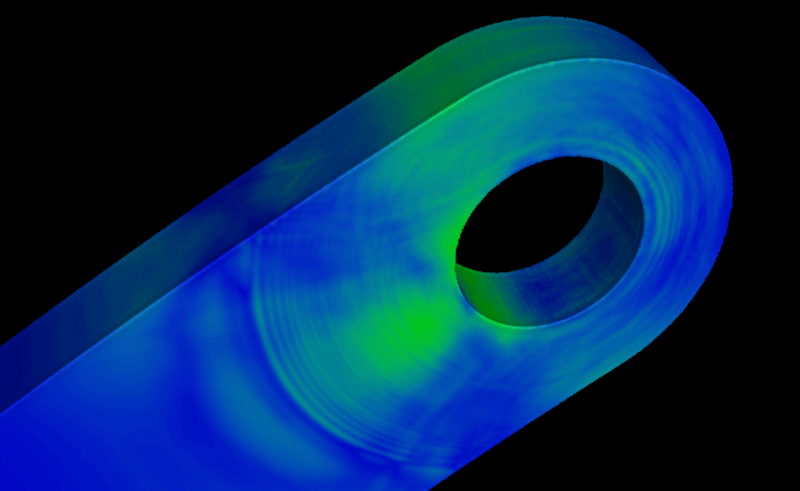 As is often the case, the mesh from scan data is simplified as the mesh captured by digital scanning is often far too large for traditional FEA software. This poses the risk of deviant results of what will be analyzed, that is… it is not exactly the same object that was scanned. The second and typically less obvious loss of information is; what happened “inside” the shell of the object scanned during the manufacturing process? This scanning technology not only captures the outside, but the inside as well, including the defects that may have been introduced during the manufacturing phase. Utilizing this process creates a volume object instead of a point cloud or mesh. Yes, a point cloud or mesh can be extracted from a volume or “voxel” based object, but these become shells that no longer possess internal defect information. Volume Graphics VGSTUDIO MAX 3.0 introduced an add-on module in service pack 3 that can perform a Von Mises stress analysis using voxels, no meshes. This method retains the full fidelity of the manufactured object, as it was CT scanned. The analysis can be performed on the the as-built object with or without the internal defects included in the analysis. Without internal defects can provide comparative data to the as-designed FEA, which is similar in many ways to the optical scanning approach. With internal defects at full scanning fidelity is a new animal altogether, and has several implications – including safety factor of the design, failure analysis and lean manufacturing. The following video, which may take a moment to load, presents a simplified demonstration of voxel based Von Mises analysis on a volume object with internal defects. Only the visuals from the 3D view are presented here, sans tabular defect data. The object is steel and the loading is a mere 90 lbforce (400 Newtons), therefore the stress never gets too “hot” – but the main idea here is – internal defects affect structural fidelity, even very small ones. For more information, the link displayed in the video is clickable during playback.